Pretty soon, you may be able to get a free Pepsi from a cola dispenser just by “liking” the brand on Facebook. 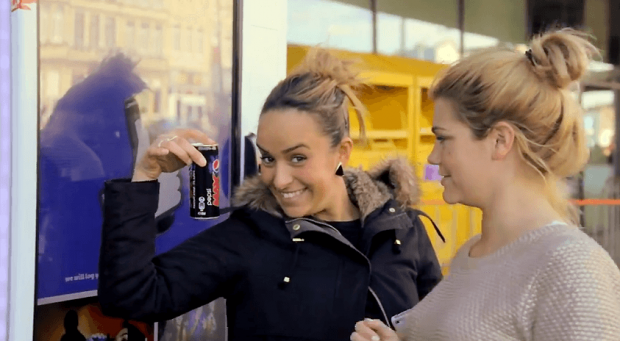 Pepsi rolled out a device called the ‘like machine,’ which basically spits out a can of soda to fans who ‘like’ the related Facebook page. As you can see from the video below, you can either perform the necessary action via your smartphone, or you can use the integrated touchscreen on the vending machine. Pepsi debuted the unique machine at a Beyonce concert in Antwerp, Belgium. Apparently, they were surprised by the results and reactions, which were largely positive. That means it’s likely they’ll start rolling out the vending machine to more locations. Although, I’m not entirely sure the company is going to give away an endless supply of Pepsis for free so expect any future rollouts to be limited. This is certainly not the first time a soda company unveiled a rather unorthodox machine to garner some publicity. Diet Coke launched the “world’s thinnest vending machine” in France just this year. Coca-Cola also launched a similar campaign which allowed residents in India and Pakistan exchange sodas to each other as a friendly sign. It was a gesture by the company to help thin the rising tension in the region. Pretty neat stuff. Do you prefer Pepsi or Coke? Would you ‘like’ either brand on Facebook if they adopted this campaign? Of course, the most important question is: who wants a free soda?